Toys R Us has Chicco NextFit Zip Air Convertible Car Seat on sale for $224.99 after 25% off with promo code “SAFETY25”. Free Shipping. 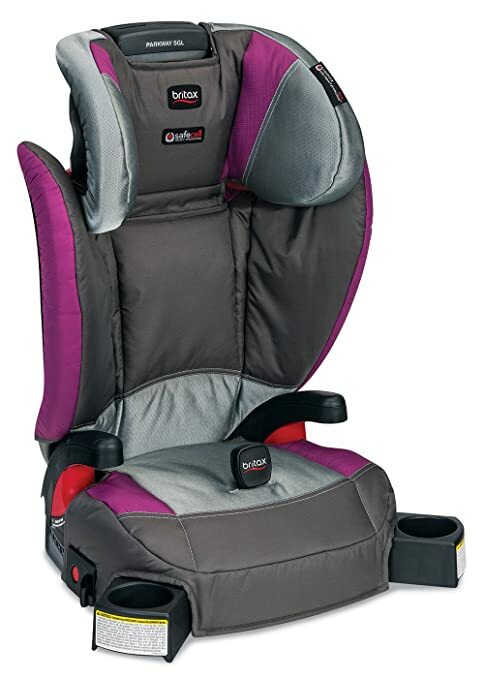 Chicco NextFit is one of the top convertible car seats. For more, check out the best convertible car seats 2019. This entry was posted in Car Seat Deals, Car Seat Types on September 17, 2017 by admin. If you have come across this page, you probably know that there are different types of car seats. Well, did you know that there are different types of car seats by age? As your children grow older, you will need to change their car seat. Familiarize yourself with child car seat safety laws and the importance of using the proper car seat. Finding the right car seat is crucial for your children’s safety and it is necessary to understand the differences between car seat types. What Car Seat Do I Need? Choosing the correct one depends on your child’s current age and size. There are 3 main types of car seats: rear-facing, forward-facing, and booster, but there are also combination and all-in-one car seats, which converts one type to another. As the name suggests, an infant car seats are types of car seats for babies and newborns. These are also known as rear-facing car seats, meaning they should should always face the rear of the car. They seats are not meant to be turned around to a forward facing position. Infant car seats feature a harness, and in the event of a crash, cradles and moves with your child to reduce damages to your child’s neck and spinal cord. One major advantage of buying an infant car seat is that it is portable and comes with a base that stays in the vehicle. The infant car seat can function as a carrier so that you can easily use the car seat to carry the baby out of the car. 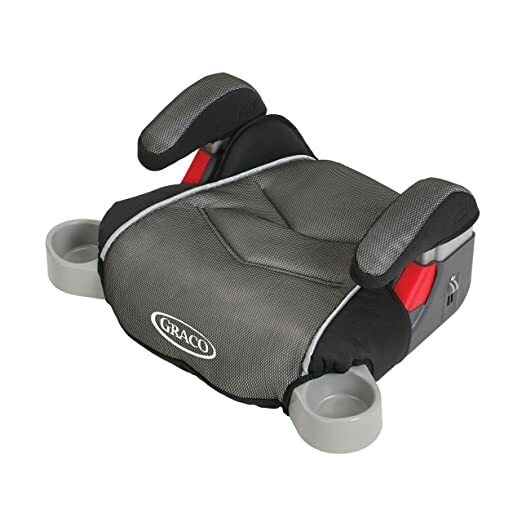 These baby car seats can be snapped into an adjustable base that is strapped and remains in the vehicle. The versatility of these car seat carriers is convenient for parents because they can easily transport their baby from the car to their home without having to disturb the baby’s sleep or remove them from their comfortable seat. Any child under the age of one should ride in this type of car seat. Some babies outgrow their infant car seat faster than others and may need to switch to a car seat designed for older babies sooner. Do you know when to change to convertible car seat? Knowing when to change the car seat depends on the growth rate of your baby. Infant car seats typically have a weight limit of 22 to 35 pounds. Once your baby has reached the weight or height limits allowed by the car seat’s manufacturer, you will need to switch to a rear facing convertible car seat. However, until your baby has reached the weight or height limits, keep him or her rear-facing for as long as possible. This is the best way to keep your baby safe. Check out the top infant car seats. 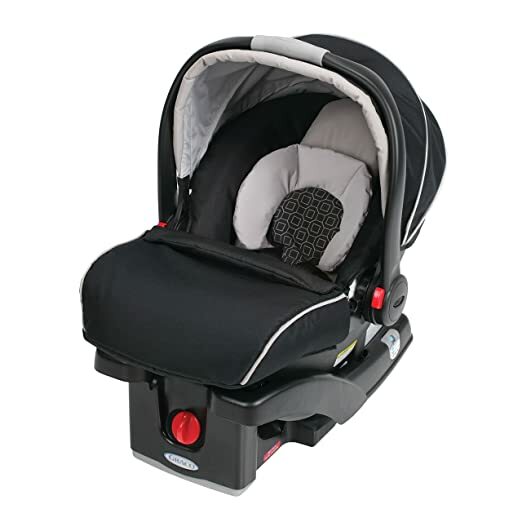 Amazon is currently selling Graco SnugRide Click Connect 35 Infant Car Seat (pictured above) for $142.29 with free shipping. A cheaper alternative is the Graco SnugRide Click Connect 30 LX Infant Car Seat for less than $100, which has a lower weight and height limit. When your child has outgrown the infant car seat, it is time to convert to a forward-facing position. Convertible Car Seats, also known as forward-facing car seats, feature a harness and tether that limits your child’s forward movement during a crash. A convertible car seat is one that can be changed from a rear-facing seat to a forward-facing seat with a harness and tether. Convertible car seats usually have higher height and weight limits, which allow children to sit in the rear-facing position for longer. You can actually buy a convertible car seat from the beginning and keep the car seat in a rear-facing position for your newborn. As your baby grows, you can then switch the car seat to forward-facing. Check out the top convertible car seats. Although buying a convertible car seat for your newborn from the beginning is a cheaper option, there are other advantages to using infant car seats. It is important to understand your needs and weigh the benefits of buying an infant car seat or a convertible car seat. Read infant car seat vs convertible car seat to learn more about the differences. Amazon is currently selling Graco My Ride 65 LX Convertible Car Seat (pictured above) for $106.88 with free shipping. A cheaper alternative is the Evenflo Tribute LX Convertible Car Seat for $52.98. When your child outgrows the forward-facing car seats that have a five-point harness system, he will need to sit in a booster seat in the back seat. The booster car seats have a three-point belt system to keep your child restrained. The purpose of a belt-positioning booster car seat is to boost or lift your child so that the vehicle seat belt fits properly across the strongest parts of your child’s body. Booster seats must be used with both a lap and shoulder belt. There are two types of booster seats: booster seat with high back and backless booster seat. A booster seat with high back provides neck and head support and is ideal for vehicles that do not have head rests or high seat backs. Backless booster seats do not provide head and neck support and is good for vehicles that have head rests. Continue to use a booster seat for your children until he or she is big enough to fit in a seat belt properly. Read more about children’s booster seats. Amazon is currently selling Britax Parkway SGL G1.1 Belt-Positioning Booster Seat (first picture above) for $128 with free shipping. 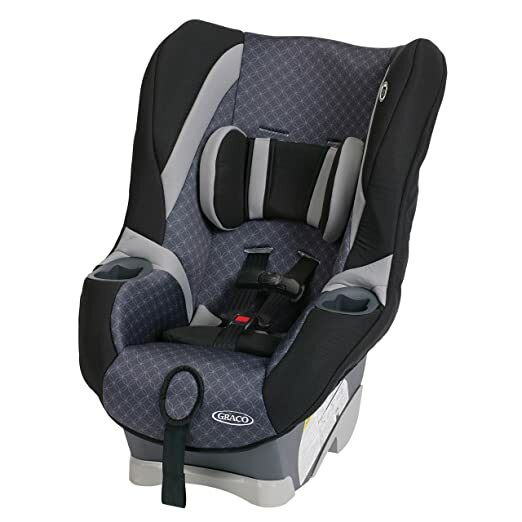 There are also backless booster seats such as the Graco Backless TurboBooster Car Seat (second picture above) for $22.59. If you have multiple children or have a small car, consider purchasing a narrow car booster seat. Instead of purchasing forward-facing and booster car seats separately, you can consider purchasing just a toddler booster car seat, which is sometimes referred to as a combination seat. Toddler booster seats are types of car seats for toddlers. They have a five-point harness that can later be removed and used as a belt-positioning booster car seat. Some people use this type of car seat because their child has outgrown the forward-facing car seat but the child is not ready to stay seated properly in a booster seat using the lap and shoulder belt. Another reason parents might buy this type of car seat is for those who have multiple children and pass their older child’s forward-facing car seat to their next child. Instead of moving their older child into a booster seat prematurely, he can use a combination car seat. This will allow the older child to stay restrained by a five-point harness for longer. Once their child has outgrown the harness capacity of the combination seat, the harness can be removed and the seat can be used as a belt-positioning booster seat. 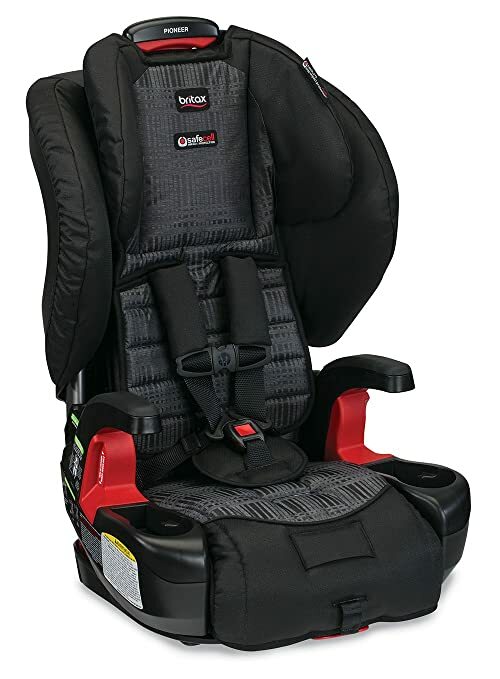 Amazon is currently selling Britax Pioneer Combination Harness-2-Booster Car Seat (pictured above) for $184 with free shipping. A cheaper alternative is the Evenflo Chase Harnessed Booster Car Seat for $64.99. This type of car seat can change from a rear-facing seat to a forward-facing seat with a harness and tether to a booster seat. Since this type of car seat can be used with children of various sizes, it allows them to sit in the rear-facing position for longer. Although buying an all-in-one car seat is cheaper, there are advantages to buying separate car seats dependent on your child’s age. 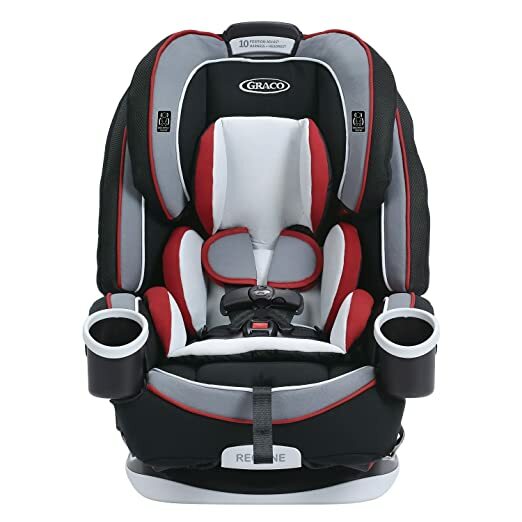 Amazon is currently selling Graco 4ever All-in-One Car Seat (pictured above) for $299.99 with free shipping and Graco Milestone All-in-1 Car Seat for $229.99 with free shippping. When your child is ready to use a seat belt, make sure the lap belt lies comfortably across his upper thighs and not the stomach. The shoulder belt should lie comfortably across his shoulder and chest, and not cross the neck or face. Even when your child is using a seat belt, he should still ride the back seat because it is safer. Not only is it important to check the car seat’s requirements, but it is also important to check your state laws. Many states have age, height, and/or weight requirements that a child must meet before he or she can transition to a different car seat type. This entry was posted in Car Seat Types and tagged child safety seats, types of car seats, types of safety seats on March 10, 2016 by admin.